Apparently, people DON'T like hearing that their stuff is out of style. However, I think they might be missing the point. When I write about trends or what is popular now in design, I'm in no way suggesting that you should trash your whole house and start over (most of the time;-). And really, I don't think any of the designers quoted in the article are either. I'm just suggesting, that IF you are doing a new project in the next year, IF you are about to remodel or are investing in new furnishings, then perhaps you should take note of what is popular today and, moving forward, think about incorporating something that might make your home feel more current and up to date. There are ways to keep some of what you have and incorporate some newer, fresher designs or styles in order to make your home feel like it has a new look. I've linked some of those type of posts I've written before at the bottom of this post. Now, my top 5 What's Hot, What's Not Trends for 2018! 1) Crypton Fabrics - I think we are going to see this fabric explode this next year in home furnishings. It's already sooo popular. Everyone wants durability in their upholstered furniture. I'm doing these fabrics on all kinds of upholstered furniture these days whether there are kids and dogs in the house or not! Check out more about Crypton Fabrics in this post where I have used it in projects recently. 2) Transitional Decor - People are going for cleaner, more modern lines in furniture, cabinetry, and design styles overall IMO. I rarely have a client come in these days and ask for crystal chandeliers, heavily detailed wood, antiques, etc. Although I still love inserting some antique furniture here and there, that old world look is not something people are asking for anymore. 3) Quartz Countertops - Even though I love the look of natural stone and so do many of my clients, the man-made quartz products are looking amazing these days. The best thing about these products for a designer and homeowner, is that they look like the sample! You get consistency and can depend on the outcome of the look when you go man-made. Not to mention durability AND beauty are key. 4) Rugs Galore - While I love a seagrass rug as much as anyone and I have two in my own home (that I'm not trashing, btw), I think more patterned, colorful rugs are definitely enjoying a resurgence. Of course the boho look celebrates that color and pattern on the floor, but I think people are definitely more interested in making a statement with their rugs these days. 5) Checkerboard Floors - After staying at The Culver Hotel before Christmas, I fell in love again with checkerboard tile floors. Their classic black and gray marble tile was a bit aged and worn, but they had a sophisticated patina that smacked of a classic design style that would last. I'm all for investing in quality materials that will stand the test of time and this pattern does just that. 1) Rose Gold Metal Finish - Come on, we all knew this one would fade out someday, right? While it still seems hot on Pinterest and Instagram, when you see it at the big box stores it's probably on the way out. By all means, keep it with accents, like your jewelry, your iphone case, maybe some cabinet pulls, etc. I wouldn't go buy a Viking range with rose gold metal finishes like this one below I saw at KBIS last year though. I think this trend will sail away in 2018. 2) Cement Tile - You think I'm crazy, right? I mean is there a single bathroom being designed now that does NOT have cement tile? While I love the patterns and products here, I see people using these in places where they might regret it on down the road. Cement tile is, well, cement or concrete. Cement or concrete cracks, stains, absorbs moisture, etc. It also can get slippery when wet. So, while it might look great and I do love it, watch WHERE you use it and make sure you understand all the characteristics of the product before you spec it. 3) Millennial Pink - While I love a pink bag, a pink scarf, a pink child's room, I'm thinking this blush color might fade from many interiors this next year. Just look at some of the eye-popping rich color that has been announced as Color of the Year for 2018. Yes, I'm thinking that our soft pink might be losing a bit of steam and people might be looking for some bolder, statement colors in their interiors in either small or large doses. 4) Cluttered Farmhouse - While I'm a fan of a clean, straightforward style of any kind, I do feel like people tended to go a little crazy with the farmhouse styled stuff this past year. Over styled interiors with lots of whitewashed and anodized aluminum items spilling off of countertops, coffee tables and bookshelves just might benefit from a bit of an edit in the new year. It's nice to leave room for a favorite new find or two to enter into the landscape of your home. Adding in some items that deviate a bit in style can layer depth and interest into a space. My mantel and coffee table decorating posts tend to focus on a full but cleaned up approach to styling these areas of your home. How To Style Your Coffee Table — An Interior Designer Reveals Her Best Tips & Tricks! When you take a look at the coffee table from above, it actually looks quite good. However, when you're roaming around in the space and see it, there was something about it that just didn't feel right. And my client agreed. Adjustments had to be made. With all the ideas, tutorials, and how to guides on how to decorate your mantel that are being shared around the web lately, that can only mean one thing: Mantel decorating lollapalooza season is in full swing! I just referred back to a post in Domaine last year at this time that said marbleized wallpaper was the hot new thing for 2017. I have to say, I'm not quite over it, but I do think it is a trend. Marble look phone covers, marble look fabric, marble look paper goods, etc., they just might not last forever. Yes, we love white marble, the real deal is so good. But the imitation? That said, I love quartz countertops for kitchens especially and won't ever go back on that prediction! I've written lots and lots of posts about updating a home while reusing some of what you have. Here are just a few, linked below. I recently did a local design consultation with a homeowner who had large kitchen that they wanted to update. They had just moved into their home and had a lot to do to furnish and make this home their own. Does this sound familiar? If so, read on to see how I advised them with their partial remodel. Terracotta Tile Floors - Do Not Rip These Out! I recently had a Designed in a Click consultation with a homeowner who had terracotta or Saltillo tile floors in her kitchen and wanted to do a remodel. Since her floors had been down for almost 30 years, she couldn't find the tile again to use to patch in the floor if she changed the footprint or layout of her kitchen. Click through to see how I advised her and see if you agree. How To Make Ugly Cabinets Look Great! If you remodeled your suburban home 10 or even 5 years ago, and you live in a hot climate like we do here in The Woodlands, it’s quite probable that you have travertine floors and are eager to update them. Suppose you don’t want to go dark. Suppose you want to go gray, but you like light and airy. How do you go gray after being beige for all these years? How do you take your warm colored house that has beige or gold in it and introduce the cooler shades of gray? 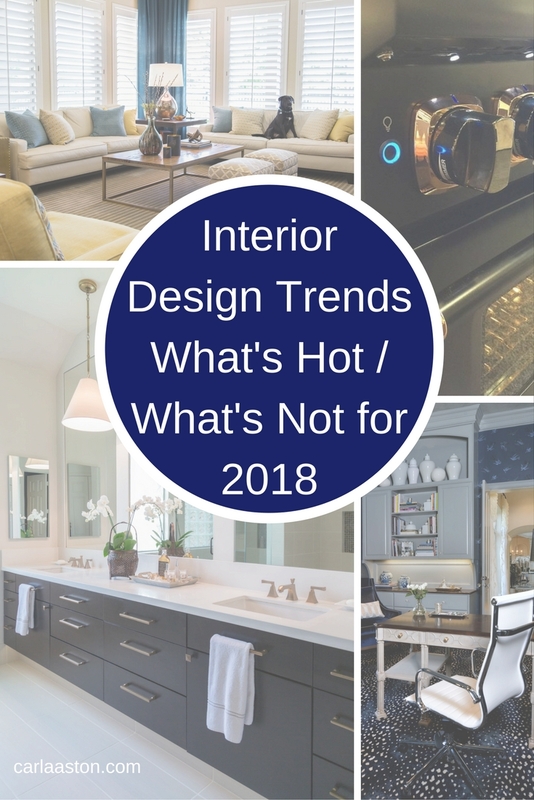 Lastly, want to know what obvious design trends that have been popular in the last few years that I think will continue on in 2018 and beyond? Check this post out below.